The Trent River flows into the Bay of Quinte at Trenton, Ontario. It is a major river and below are records stating that a ferry service was in operation as early as 1794 and the first petiton for a ferry lease was in 1802. An early petition in 1801 for a bridge came to nothing and an active ferry service continued through to 1833 when a bridge was finally built. The petitions below for ferry leases and a bridge, are presented chronologically. They tell an interesting story. Thanks to Peter Johnson for finding the 1801 and 1808 petitions and getting things rolling. The old covered bridge was built in 1833. 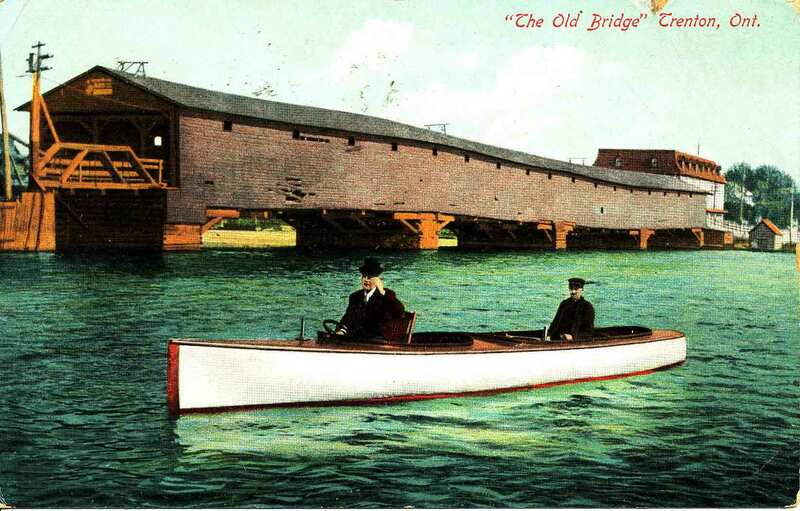 This is one of many postcard views of the landmark "old bridge" in its decaying days about 1910. It was replaced in 1916. In 1830, before the bridge was built, Thomas Burrowes painted a fine watercolour titled the Ferry at the Mouth of the Trent of the ferry docks on the west side of the Trent River at Trenton. These docks and the inn were built by either Adam Henry Meyers (1820) or John Murphy (1830) and are mentioned in their petitions below. The docks were located at the same spot where all the bridges have been built. An image of Burrowes painting is mid way down this page at the Archives of Ontario web site. You must search the site to see a full screen image. The Covered Bridge at Trenton, Gerald Boyce, Hastings County Historical Society, 1980 is a very informative 16 page booklet about the story of the covered bridge with maps and illustrations. The accounts below include the source notes. New - 1805 - survey mentioning the Ferry location. In 1789, Judge James Smith Esq is granted 200 acres, lot 3, Con 2, Sidney with a promise of 500 more acres to come. James was named with Alexander Chisholm, Martin Fraleigh and John Ferrier as meriting 700 acres each. However James settles (squats) on the east shore at the mouth of the Trent River without title and later in 1795 his petition for title to this land is denied because the shore land is reserved for “works of defence”. On 24 Apr 1795, DW Smith, act Surveyor General submits a report that states that James Smith's petition for 700 acres can’t be satisfied. It clarifies that the river runs north south and that James Smith has started to settle the east side. He writes that the lands "would materially interfere with the regularity of the Township of Murray, and that Mr Smith, some years ago, rec’d official information from Mr Chewett, as well as from Mr Aitken that all the space between the west boundary of the Township of Sidney and the east bank of the River Trent / on which he has settled / has been reserved by Mr Collins in the year 1787 for works of defence, etc." Rec'd 20 May 1800, John Smith, son of Judge James Smith, Esq, the Bay of Quinty, petitioner has a location for 200 acres prays may be allowed to locate on 100 acres at the Carrying Place at the head of the Bay of Quinty, will settle and improve the same. referred to His Excellency. Rec'd 26 May 1800, John Smith petitons for a lease. He has obtained from his father south and east half of lot 3, 2nd Con, Murray, wished to build a mill on lot and wishes to lease the remainder of said lot. - deferred. See petition of Wm Fairfield Jr, GW Meyers and Matthias Marsh. On 16 Dec 1802 at York, John Smith, Murray, yeoman, petitions that for the last eight years has assisted travellers over the mouth of the River Trent and for the four last years he has been upon his own land adjoining the passage, but not having a legal right he has been at no great expense, prays that he be granted a lease of the ferry, he will engage to build a proper craft for the accommodation of travellers under such regulations as Your Excellency may ???. 7 Feb 1801, Township of Sidney, Matthias Marsh petitions the Honourable John Helmsley "Having taken a view of the place proposed for building a Bridge across the River Trent and also considered the costs and expenses which I think will attend the same I have ventured to send forward the following proposals for the consideration of the Honorable Council -- First the bridge to be eighteen feet wide -- Second, to join the main banks with two good and substantial Stone Butments -- Third, to rest on four stone pillows at the distance of seventy five feet apart each from the other -- Fourth, the pillows to be built of stone and to be Twelve feet thick for the width of the bridge and to terminate thence with a sharp point of twelve feet in length against the stream which will make the pillows thirty feet in length-- Seath, the timber shall be oak and pine ....... the subscriber will obligate himself to compleat the same in the space or term of One year and a half ...... at the sum of One Thousand Six Hundred pounds Halifax Currency .... But should the Council think proper to build the Bridge twenty feet wide the expence will be one hundred and fifty pounds more ...... The subscriber always warranting the said bridge to remain and stand for the term of four or five years from the time he shall compleat the same (against the natural stream and its consequences) he would not be understood to be warranting the Bridge to withstand the force of large rafts that may be possibly brought against it. Only the River and what may naturally belong to it during the different seasons of the year as Ice, Driftwood, etc ....."
Source: UCLP, 1792-1816, M Misc/67, V325, AO, C-2189. See also: The bridge that would never be, Peter W. Johnson, The Trentonian, Aug. 19/1994. 25 Feb 1805, York, Surveyor General Office, a report upon the petition of John Bleecker Esq, that on 29 June 1793 it was ordered in Council to confirm John Bleecker in the land he had actually improved, upon the reserves to the Extent of Thirty acres and that he may receive a lease for the remainder of the 200 acres upon paying a small acknowledgment. In 1808, after being rebuffed in 1802 as "unworthy", the same John Smith, with the signatures of fifty two local supporters, petitions again for a lease for ferry rights stating that he has been doing it for 12 years and has built two scows. No record of a response from land books has been found. The petition may have been ignored. There is no record of Mary Bleecker being given the rights to run the ferry but the record below indicates that she must have received permission to run a ferry about 1808 or before. Her influential husband died in 1807 so maybe she was given the rights to help her out after John Smith, above, was refused. Or, perhaps being a daughter of Capt John Meyers helped her to obtain the ferry rights. In 1811 she was given a licence to run an Inn in Port Trent (Trenton) so she was a capable and busy women. The information below is written on a single piece of paper. Also included in the papers is an annual licence dated 6 Jan 1811 to be an Inn Keeper and sell spirits. Ordered that Mary Bleecker be allowed the following fees, for keeping the ferry at the River Trent in the Township of Murray. Approved in the Court of Quarter Sessions this 13 April 1808. John Richard Bleecker, son of pioneer John Bleecker, ran the ferry during the war of 1812. 24 Jul 1819, Cramahe, I do hereby certiy that the bearer John R Blaker, son of the late Lieut Colonel John Blaker, has resided upwards of 25 years in the District of Newcastle and that he served faithfully as a Private in the First Regiment of Northumberland Militia during the late War with the United States of America. That his service in the regiment for a consider part of the War was performed by substitutes when he was attending the public ferry at the River Trent for which he received no compensation. Given under my hand at Cramahe, M? Peters, Lt Col, Comg Regt of Northumberland Militia. "Remembers the time in 1812 held the rank of Sergeant but performed no active duty. With his brother kept the ferry at Trent. Used to ferry troops back and forth, and provisions. Never had any remuneration. Was engaged for some weeks to guard some pork from Kingston. Helped themselves to what was wanted to eat. (Remembers ferrying the troops when retreating from Toronto after its capture) The pork was brought by batteaux and left at the Indian carrying Place." In July of 1820 the Executive Council announced a tender for a "lease of the ferry at the mouth of the River Trent" to be given to the highest bidder. David Johns was the successful bidder over Adam Henry Meyers, Joseph Clement and Henry Franklin. Johns agreed to terms of £15 per year for three years. It looks like his partner, John Richard Bleecker, dropped out of the bid. Murray 4th August 1819 We … certify that John Richard Bleecker is a worthy man … and is in a situation to furnish everything necessary for a ferry …. John Moody is named as the ferry lease holder instead of David Johns who was given the lease in 1820. Claudius Christie obtained the ferry lease in early 1826 and about 1829 he sold the rights to the lease to John V Murphy who in 1831 petitioned for an extension. 22 Dec 1825, Kingston, Claudius Christie, of Township of Kingston, Innkeeper, served his country for ten years as a sergeant in 70th Regiment of Foot and at the reduction of the army in 1822 was discharged and having a wife and eight children and being desirous to obtain the lease for the ferry across the mouth of the River Trent ……..
Around 1829, John V Murphy, buys the rights to the ferry lease and in 1831 petitions for an extension. Later in 1833, when the bridge is being planned he petitions for a lease to run until the bridge is finished. However, this is not profitable and he petitions to get out of the lease and this request is granted. 14 Nov 1831 In Council Recommended that at the expired term of the lease the ferry be advertised in the usual way. 14 June 1834, River Trent, John V Murphy of Murray, yeoman … has been for the last three years the lessee under the Crown of the ferry across the mouth of the River Trent and has regularly paid all rents … When a new lease was to be granted in the month of June last your petitioner proposed to pay the sum of twenty pounds for the same until the bridge across the river should be completed which according to the terms of contract with the builders was not to be till the first of October next and which proposal was duly accepted …. That immediately after the proposal was accepted the contractors began erecting the bridge which extends directly between the two points at which your petitioner had established convenient landing places for the boats and other vessels used for such ferry whereby your petitioner was placed under the necessity of landing persons and other matters ferried by him on the lands of other individuals who invariably complain of injury done them some of whom even threaten to prosecute. That during last season your petitioner was unable to ??? from the ferry a sum sufficient to pay a man for attending to the same owing to the facility of crossing the river in the numerous boats and other vessels used in building the bridge which now is and has been for upwards of a month the only mode of crossing the river being thrown open on all occasions as well by night as by day. Nor does your petitioner think that he has any legal remedy against the contractors or any other persons for the loss and damage he has thus sustained as they make it appear that the bridge is kept open for their own convenience and that of their workmen ….. your petitioner prays .. that no rent be expected .. from the commencement of his present lease and that he be discharged from liability for the same. "The site recommended by the engineer is about 500 feet from the present line of ferry across the River. A Petition of Sheldon Hawley, and 216 others, represents that the nearer the mouth of the River a Bridge shall be built, the greater will be the probability of its permanence. On the other hand, a Petition signed by 518 individuals, objects to the erection of a bridge at any point that may ultimately obstruct the navigation of the River, or that may interfere with the formation of a safe and commodious Harbour." The bridge was open at least by May 21, 1834 because surveyor F. P. Rubridge wrote in his notes while surveying that he paid 5 shillings toll fees for "myself and men." In the 1846 a list of toll fees are stated for all toll bridges and the Trent River bridge is included.